IMTBIKE is driven by its passion for making sure that you enjoy your motorcycle vacation to the fullest and we strive for perfection in all details of our tours and rentals. It is the combination of our passion for motorcycling and our desire for perfection that makes touring with IMTBike something extraordinary. When you are exploring your options in motorcycle travel your best resources are your friends or past tour members that have enjoyed a similar experience. At IMTBIKE we are very proud of the outstanding reputation we have earned since 1997 for having exceptional guides, perfect motorcycles, top-notch hotels, professionally designed routes and an overall motorcycle touring experience of the highest quality. IMTBIKE is an Official Partner of BMW Motorrad. IMTBIKE has been an Official Partner of BMW Motorrad since 1997. Our guides have also successfully completed the BMW International Tourguide Academy. This means that we adhere to the highest standards set by BMW Motorrad for our motorcycle tours and rentals. We also enjoy the support of all BMW dealerships in Europe. If there is ever a problem with a motorcycle you are never far from a BMW dealership where you will receive VIP treatment! We know and love the regions we tour. IMTBIKE has been running outstanding motorcycle tours and rentals in Spain, Portugal, Morocco, France and Italy since 1997. In these years we have not only been traveling extensively through these regions learning their history and cultures, but also developing relationships with the local people. We are happy to share all this cultural knowledge with you to offer you a truly authentic experience. This is what tour members have told us repeatedly, so it must be true! All of our guides adhere to the highest BMW Motorrad standards but more importantly our guides are fun and personally interested in making sure that you enjoy your motorcycle vacation to its fullest. All of our guides are multilingual and experts in the regions we tour and they are happy to share their cultural knowledge with you. Our guides are also expert motorcycle instructors that take a “safety first” approach on all of our tours. Their main goals is to make sure that all tour members stay within their comfort zone while riding. They are also available to share riding pointers with you to make you a safer and more confident motorcyclist. IMTBIKE´s routes are professionally designed by Spanish motorcycle journalists which include the 30-year veteran Tourism Editor of MOTOCICLISMO and also a longtime journalist for MOTOCICLISMO, LA MOTO and MOTOS.net, all the most popular publications in Spain. Our routes are constantly inspected and revised to make sure that we always enjoy the best motorcycle roads in the countries we tour. New fleet of fully equipped BMW motorcycles. IMTBIKE has the largest fleet in Europe of new model fully-equipped BMW motorcycles with over 170 motorcycles in its 7 different rental centers. Our fleet is also renewed every year and a half to make sure that you always have a motorcycle in great condition and with low kilometers. All of our motorcycles are equipped with two BMW sidecases and a padded topcase so your passenger will be comfortable on your tour or rental. Our motorcycles are also inspected by BMW certified mechanics before they go out. IMTBIKE uses primarily 4 and 5 star hotel accommodations and we are constantly making sure that the quality of these lodgings meets strict IMTBIKE standards. In Spain and Portugal we use National Paradors and Pousadas. These are historical castles, palaces, and fortresses that have been converted into superb motorcycle-friendly hotels with excellent gastronomy. In Morocco we use 4 & 5 star hotels and Riads. A Riad is an old palace normally in the Medina or Casbah that has been turned into charming luxury boutique hotels. We know that for true adventure travel small personal groups are the only way to go. This is why we work hard to run our tours with a maximum of 10 motorcycles. Groups this size create the personal feeling of riding with friends (which the tour members will become before the end of the tour!). You will also make friends with your guides; you are never just a number. This camaraderie defines IMTBIKE tours. IMTBIKE’s organized tours have two professional guides. The head guide will be on the lead motorcycle and the support van driver will always trail the group in an IMTBIKE van. If you ever need anything out of the van all you need to do is pull over on the side of the rode and the van driver will stop so you can get whatever you need out of our van. Our support vans will carry your luggage, any purchases you make, spare motorcycle parts and there is always room for a friend or a family member that love to travel but prefer four wheels. 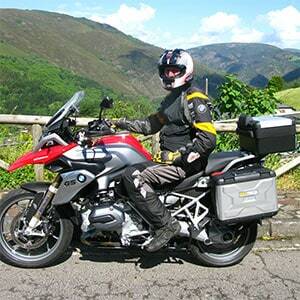 IMTBIKE has been offering outstanding motorcycle tours in Spain, Morocco, Portugal, Italy and France since 1997.